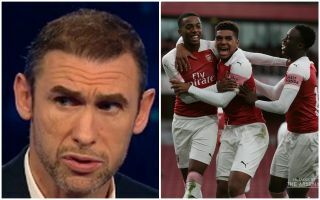 Arsenal legend Martin Keown has essentially told manager Unai Emery that Joe Willock needs to be a first-team regular now or be allowed a transfer away. The 19-year-old midfielder scored a well-taken goal this evening in the Europa League – his first for the Gunners’ first-team. Keown is a big fan of Willock’s potential and insists he is now at the stage where he needs to be playing regularly, whether that’s at the Emirates Stadium or somewhere else. The teenager could well follow Reiss Nelson in moving on loan, with the winger being another of the club’s impressive crop of academy players at the moment. Willock could also be well advised to follow Nelson and others like Jadon Sancho in making the move abroad in order to get more playing time, as it’s become so hard for English talent to get a look in in the Premier League. Either way, Keown clearly feels strongly that Willock should be playing and it will be interesting to see if Emery takes his words on board. ‘I’ve been really impressed with this young man,’ Keown said on BT Sport, as quoted by Squawka News.